Habit: Zamia pumila grows from an underground vertical stem 15-40 in length and to 15 cm in diameter. Leaves are produced from the top of the tuber. The leaves are pinnately compound, to 1 meter in length and covered with rusty brown hairs when young. The leaflets are to 25 cm (typically shorter) in length with a slightly toothed apex and an entire margin (occasionally irregular). The dioecious reproductive structures are cones. Microsporangiate cones are solitary or in groups, to 8 cm in length and 2 cm in diameter. There are 15 - 20 series of peltate hexagonal structures underneath which are the microsporagium. The megasporangiate cones are solitary, to 20 cm in length and 6 cm in diameter. There are 5-8 series of peltate hexagonal structures underneath each where the ovules are located. The entire structure is covered with reddish hairs. Habitat: Zamia pumila grows in Pine Woodlands as well as coastal Dry Broadleaf Evergreen Formations-Shrublands. 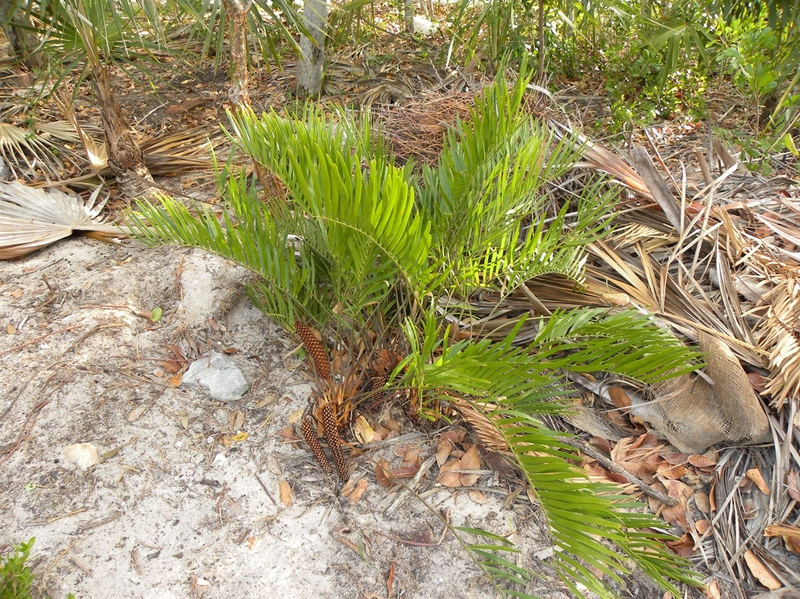 Distribution in Bahamas/Globally: Zamia pumila occurs in the central and north island groupings of the Bahamian Archipelago. There is a subspecies that is endemic to the Bahamas. 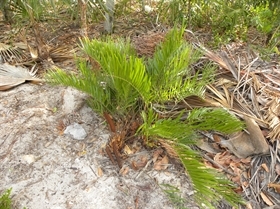 Medicinal/Cultural/Economic usage: Zamia pumila stems have been collected and used as a food source but are not used medicinally in the Bahamas. Zamia pumila is used in the horticultural industry.